In Kristin Hannah’s The Great Alone, courage and perseverance battle the threatening elements of the Alaskan frontier in a family saga of the untamed wilderness. Using elements of her own family’s experience in Alaska, Hannah captures the raw beauty in the magnificent stillness as well as the terror of survival in an unforgiving landscape. Much like Ivey’s historical novel – To The Bright Edge of the Word, The Great Alone invokes the forbidding yet beautiful lure of Alaska as well as the fortitude of those who would live there. A young girl, Leni, narrates her life story from 1974 to 2009, documenting her struggle in a family plagued by her father’s post-traumatic stress disorder following his return as a prisoner of war in Vietnam. Moving from place to place, looking for peace and a place in a “world being run by lunatics,” her father suddenly inherits a parcel of isolated land in Kaneq, Alaska from a dead Army buddy. The family leaves Seattle to become pioneers in a place promising freedom from the trauma of the seventies – the Munich Olympics, Watergate, hijacked planes, and more. Unprepared, the family struggles in a run-down log cabin with no electricity or running water, and only makes it through with the help of their neighbors, but Ernt, Leni’s father, sinks deeper into depression and becomes more abusive as the days become long nights in the Alaskan dark winter. The characters surrounding the family represent a chorus of sturdy, sometimes stereotyped pioneers, from the tough former prosecutor, Large Marge, to the wealthy Walkers, descended from a hearty stock of generations of homesteaders. Earl Harlan, the old codger whose son, Bo, gifted the land, feeds Ernt’s negative outlook on life with his own pessimistic ramblings. The liquor helps too. Looking for a connection, Leni finally finds it in a young Matthew Walker. As they grow from adolescence into young adulthood, their story becomes a Shakespearean tragedy, yet this Romeo and Juliet find ways to nurture their love despite their families’ feud and her father’s abuse. Through them Hannah reveals not only the wonder of the Alaskan beauty but also the hope of future generations. As I read, I worried. Would they meet the same fate as Shakespeare’s lovers? Would the villain (the abusive father who becomes uncontrollable) destroy everyone around him? Be assured, this is Kristin Hannah, an author who believes in happy endings. Although the ending is somewhat contrived, and not everyone lives happily ever after, the lovers do survive. In a world of conveniences, it’s easy to forget how difficult life was not so long ago. Despite its modernization, in Alaska, the “last frontier,” some still battle the rough and brutal elements and live “off the grid.” Hannah uses them to demonstrate survival and communal strength; after all, love conquers all. How long do you expect to live? Chloe Benjamin uses the theory of expectations to deliver a compellng family saga of four siblings who visit a fortune teller after their father dies at forty-five. When the clairvoyant names the dates they will die, predicting a short life for the younger two, middle-age for the oldest son, and a long life for the eldest daughter, each designs a life destined to fulfill the phropecy. Each life is revealed separately, weaving in the circumstances of the others over fifty years. Simon, the youngest, drops out of high school to escape to San Francisco in the nineteen eighties with his sister, an aspiring magician. Knowing he will die young, he adopts a reckless gay lifestyle leading to devastating consequences. The deaths of the two middle children seem contrived with both dying on their appointed days, but Benjamin reveals her message with Vy, the eldest and longest living, who works as a researcher for a pharmaceutical firm developing a longevity formula. To live to her predicted 88 yesrs, Vy has severely limited her caloric intake and avoids physical contact, suffers from an Obsessive Compulsive Disorder, and lives in fear. An observer of her life comments she may be surviving but she is not living. I remember a line from a movie with Tom Hanks asking the spy who is about to be sentenced why he is not worried. The spy answers: “Would it help (to worry)?” What will happen will happen. What would you do if you knew the date of your death? Would you try to change your life’s trajectory or worry as the date drew near? Across four generations of Koreans, Min Jin Lee follows the history of Korea as it struggles through poverty, sublimation under Japanese rule, and the famous war dividing the country as it is today. Nominated for the National Book Award, Pachinko captivates the reader with its characters while revealing their long and continuing effort for freedom and prosperity. The timeline begins in Japanese-occupied Korea in the early 20th century, continues to Japan before World War II and finally to the late 1980s in Japan. The novel opens with an arranged marriage in a fishing village in what would be South Korea today. The one daughter from the marriage, Sunja, is the continuing fulcrum for the story of her progeny. When Sunja falls in love with a prominent and older married mobster, Hansu, she becomes pregnant. After declining Hansu’s offer to be his Korean mistress, she accepts the offer of marriage from a local Presbyterian minister from the North visiting her parents’ boarding house. She escapes her disgrace by marrying him and immigrating to his brother’s house in an ethnic Korean neighborhood in Osaka, Japan. Throughout the novel, Hansu’s influence acts as a counterbalance. His world of gambling seems innocuous until an incident reveals his cruelty and mobster power against anyone who crosses him. Koreans in Japan were noncitizens, forced to change their names and regularly reapply for passports within a country where they might have been born. Discrimination against them ranged from outright hostility to snobbish avoidance. Sonja’s sons do not escape being ostracized; Noa, the son of the gangster and first in his family with a university education, yearns to be Japanese, his younger brother, Mozasu never seems to attain social status despite his wealth and connections. Both sons eventually become pachinko house managers. The author successfully reveals the complicated state of Koreans in Japan, covering difficult topics from the yakuza, immigration, and real estate deals to personal views of expatriate life, religion, and, of course, the pachinko industry. A book of substance and introspection, Pachinko is a story worth reading and discussing; this reader will never make the mistake of forgetting the history and individualism of Asians. 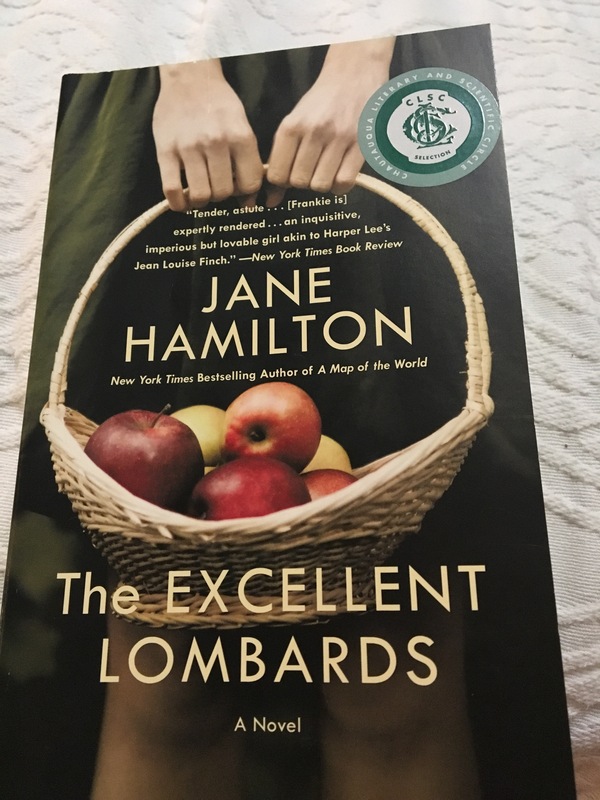 If I hadn’t read Ann Patchett’s Commonwealth, I may have missed Jane Hamilton’s The Excellent Lombards. Patchett recommended the book as “the book Hamilton was born to write.” Like Patchett’s Commonwealth, The Excellent Lombards focuses on a family, and has some biographical references from its author. Coincidentally, both books also have a character named Frances. Since Hamilton tells this coming of age story through the voice of twelve year old Mary Frances Lombard living with her family on a small Wisconsin apple and sheep farm at the end of the twentieth century, the rhythm of the narrative is hard to follow at first. Ownership of the farm lands has been passed down through generations and is now shared by Jim Lombard, Frankie’s father, his cousin Sherwood, and an elderly aunt May Hill. Everyone from old May Hill to the children, Frankie and her brother, William, work the farm, except Nellie, Frankie’s mother who is the town librarian. Frankie is determined to stay on the farm forever, imagining a long life there with her brother, but the small farm struggle against land development and innovative crops, as well as inner family rivalries, threaten her dream. Change is hard, especially when you don’t want to grow up. Hamilton, of course, has a message for the reader through tense moments at town hall meetings or around the dinner table, but the novel’s humor, cleverly flowing through Frankie, kept my attention – from her pushing the library carts through the halls in a synchronized dance routine to being locked in the old lady’s bedroom while she was sharpening her spying skills. Frankie will go to extremes to keep everyone happy, purposely losing the geography bee to her younger lispy cousin to make her feel better. Hamilton touches on historic moments such as the terrorist attack on the New York City Towers, but only as placements in time. The real terror is the developing history noone can stop. The story ends with Frankie facing her own possibilities, opportunities, and obstacles – some seem inevitable. With grace and wit, Hamilton delivers her perspective on the difficulty of letting go.